Published: Jan. 26, 2014 at 11:45 p.m. Updated: Jan. 27, 2014 at 12:39 a.m.
JERSEY CITY, N.J. -- Richard Sherman's sway over the press continued with a vengeance on Sunday night. Russell Wilson couldn't help but notice. As the Seattle Seahawks quarterback sat down to speak with reporters, he stared out at an unimpressive clump of scribes -- a few cameras and mics -- while across the room, Sherman, arguably the game's best cornerback, faced a media horde that stretched layers deep. "Richard Sherman's a great football player, he's an All-Pro," said the second-year passer. 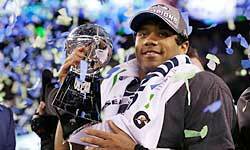 "He represents the Seahawks well by the way he plays, and just his energy and his passion. I love the kid to death." Said Wilson: "He deserves the attention." Whether or not you agree, the Seahawks are unified on the subject of Sherman. Roaming from player to player on Sunday night, I didn't hear a single ill word about the outspoken defensive back. They respect him. They enjoy him. They wouldn't be here without him. 1. Back to Wilson: Not even two years into his new job, he's one step away from the mountaintop, and it hasn't changed the guy one bit. He spoke pragmatically about the week ahead, the need to study tape, the desire to further break down Denver's defense and keep an eye on "our main focus, our only focus." He's got the poise of a young Harrison Ford and the even-keeled nature of the great quarterbacks who came before him. 2. Pete Carroll was in high spirits. When a reporter tried to ping him with a factoid about Seattle's Super Bowl experience -- noting they had none -- the Seahawks coach quickly pointed out that wideout Ricardo Lockette was at last year's big game with the 49ers. When Carroll went on to tell of how defensive aide Ken Norton Jr. (who played in multiple Super Bowls) spoke with the team about what to expect this week, he elicited a wave of laughter by admitting that "Ricardo Lockette has not made a presentation to the club yet." 3. Twenty years ago this month, Carroll was hired as head coach of the New York Jets. Asked if that came to mind as Seattle's plane hovered over Jersey, he said, without much thought, "No." 4. The Seahawks arrived at their hotel amid a crush of Seattle fans. It was madness, and just a hint of what's to come. Carroll was asked how an NFL head coach prevents the buildup from becoming bigger than the game. "If we just started talking about it this week, trying to figure it out, I don't think we'd have a chance," he said. "But we've been preparing to be a championship team all along ... and I think that our mentality is strong. I think that we understand that -- the mountain -- what it takes to perform in a game of this magnitude." 5. On that point, I'll take Carroll at his word. Seattle's played in one big tilt after another, and the Seahawks have yet to lose their cool. 6. Seahawks receiver Doug Baldwin will go head-to-head with his childhood hero next Sunday in the form of Broncos defensive back Champ Bailey. "I told myself that I wouldn't become a fan when I'm out there," Baldwin said. "I gotta keep my competitive edge, but I can't help but go up to Champ and give him a hug. Like I said, we were all fans of the game before we became players in the NFL, so it's going to be exciting." So, will there be trash talk? "Maybe," Baldwin said, sounding more fawning than menacing. 7. All-Pro safety Earl Thomas weighed in on the origin story of the Legion of Boom: "It didn't start off as 'LOB,' it just started off as guys just wanting to be the best, you know? We always talked about how we wanted to change, not only the team, but Seattle," he said. "The whole environment, everything, it's just a great energy. I think 'LOB' has a chance to be something great, and we understand that, but we're not ... near where we need to be as far as football." 8. Sherman is on record saying he's a tape junkie, and Thomas praised his teammate's ability to pick up film quickly. "Me, I'm more of a guy that needs to see the film, need to see walkthroughs, need to see it live, need to feel -- some guys like Sherman, Kam (Chancellor) -- BOOM, they got it." 9. Most underrated player on Seattle's defense? How about interior lineman Brandon Mebane. Thomas called him "the best nose guard in the league," and acknowledged members of the front seven haven't gotten their due because of the accolades heaped on Seattle's historically scary secondary. 11. Everyone wanted to know about the cold weather. Not a single Seahawk expressed an ounce of concern about Mother Nature's game plan. While we saw Wilson struggle in high winds in the playoff victory over New Orleans, he repeatedly brushed off concerns over the elements, speaking almost robotically about the mission ahead. These guys are not like you and me. 12. Finally, I must note that while my fellow scribe Dan Hanzus greeted the Broncos aboard an ornate seaship, Seattle's meet-and-greet unfolded in a dangerously bland hotel ballroom above a crowded Jersey roadway. I won't think about this too deeply.